the "BEST" sports coverage in Cushing! CushingHub's sports BLOG is the place to access more of the "BEST" coverage of Cushing sports. 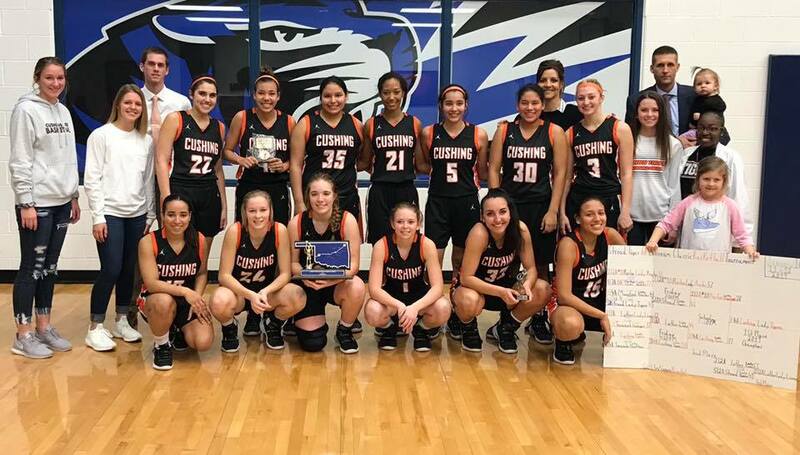 CUSHING – Halfway through the season, the Cushing Lady Tigers have made a comfortable adjustment to Class 4A basketball. Brian Busby’s varsity girls won all three of their games in the Stroud Tournament, including the championship match Saturday against Preston, and hold a 7-4 record overall. The five-game win streak includes that 37-28 win against 2A No.10 Preston and started with a 52-19 walloping of Mannford on Dec. 18. Braelyn Berlowitz was Cushing’s leading scorer Friday against Luther. She had 21 points on 5-of-12 shooting from the field and an impressive 11 of 12 free throws made. Braelyn was also named the Stroud 66 Classic All-Tournament MVP, for her performance on the court. Berlowitz was also credited with an assist and seven rebounds as Cushing won 50-44 in that tournament semifinal. Rachel Sherwood was perfect from the field, scoring 14 points on 6-for-6 shooting and two free throws. Four others – Lola Nanaeto, Navaeh Skinner, Ariya Regnier and Katelyn Carrier – combined for the rest of Cushing’s points. Ariya Reginer was also named to the All-Tournament-Team for her outstanding performance in this year’s competition. Monday January 14th the TiGERS will face Perkins in a make up game from January 4th, in Perkins. Game time tip off 6pm for the Ladies TiGERS. The Tigers will host Berryhill at 6 p.m. Tuesday evening at home. The boys varsity basketball team dropped both games in the Stroud Tournament, the worst loss of the season coming Friday against Oklahoma Christian School, 75-37. The Tigers are 2-6 in their first season under coach Jontue Ezell. They won the Dec. 4 season opener 50-43 against Bristow and knocked off Cleveland 55-52 on Jan. 8. Join the Email list and get notifications of Cushing Sports Schedules & Broadcasts.